Schlub. n. (slang) A stupid, clumsy, or unattractive person. From Yiddish. 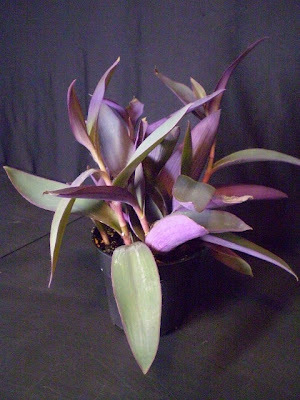 Poor Tradescantia pallida. It gets no respect from anybody. It's the Rodney Dangerfield of plants. Not long ago, I was talking with the guy who's in charge of the nursery lot at work, who stopped to make the comment that the plant pictured here didn't look half bad. Had he stopped there, we would have been fine, but then he went on to say that he felt bad about even selling them to any customers, that they looked nice for maybe a week or two and then immediately started to look like crap. And this isn't the first time I've heard this sentiment from people. Check it out: A Water When Dry post on the subject. There's also this from Mr. Brown Thumb, though it's not that negative, actually, now that I look at it again. There are also some very negative comments (mostly about it being invasive, which I'll get to) at this post at davesgarden.com. , And there's this too, which calls T. pallida the "greatest short-term threat to [John Edwards'] estate's landscaping," and blames it for . . . well, but you'll just have to go read it. This is actually one of my favorite species of indoor plant, for a very specific reason: it was one of very very few things that kept growing for me during the winter last year. And not just growing, but wildly, out of control, non-stop, enthusiastic, rampant growth. I suppose not everybody would consider this desirable, but when everything else (or just about) has stopped, and you still want to do some indoor plant-tending, it's nice to have a plant that will accommodate you. Also. It doesn't have to look like crap, not necessarily. I swear. Though you have to meet it halfway. Like with Pilea cadierei, it sometimes needs to be cut back and re-rooted, though that's easily done (which is also like Pilea cadierei). It loses leaves slowly from the base of the stem as it grows,1 which means that eventually, if you let it go long enough, you'll have a pretty sparse-looking plant. But cuttings are easy to take, and easy to root, and the remaining stems will re-sprout most of the time, so it's not all that much trouble, really. Cut off the longer, scragglier ends from time to time and stick them back in the pot and you're done. And if you don't like where it's headed, you can cut the whole plant back to the soil and have essentially a brand-new plant within 4 to 6 weeks. Or, really, two brand-new plants, since the stuff you cut back can be rooted and planted up as well. Other minor problems: the stems are brittle, and break off easily. Also the plant is invasive in warmer climates,2 so if you choose to grow it outside in the south, make sure that you plan for its eventual spread, by keeping it confined to containers or by routinely cutting it back and carefully disposing of the cuttings. Indoors, neither of these are huge problems, though rarely hanging baskets get bumped and pieces fall off. What's good about it? Well, aside from the previously-mentioned rampant growth, it's also a very nice color, when grown in good light (full sun). Less light will keep it alive, but it will be more green and less purple. Which you might prefer anyway – it depends on one's taste. The plant in the photo below has gone a bit green from low light. Add the ease of propagation to the speed of growth, and you have a plant that can, literally, quadruple its mass in a year. Seriously. I have no idea how many cuttings have left my apartment, but I know that at the very least, I've made six four-inch pots like the one pictured above, one six-inch pot, a three-foot-long planter, and at least three sets of cuttings that went out in Garden Web trades, plus I've thrown away quite a lot too, all from a hanging basket I bought around December 2006. The situation is even worse at work: the plant grows a lot faster than the demand to buy it does, and so we wind up throwing away a lot of cuttings. It also flowers easily. The individual flowers are pink with a yellow-orange center, and only last for a day, but generally the same spot will put out a new flower every day for a week or so. Nobody grows them for the flowers, but the flowers are nevertheless nice. Generally flowers only appear on a stem after the stem has decided to branch, though the plant is self-branching, so that's just a matter of waiting long enough. Extreme cold is fatal (though those I've had in the planter outside are still doing fine, and we've had at least one night with a low around 27ºF / -3ºC. I've heard they're hardy down to 20ºF / -7ºC; this is the year I find out, I guess.). Very little else can knock this plant out: it may be a schlub, but it's tough. Respect it. thank you! i love this plant! i think its so beautiful! how do you get yours to flower? i have had mine for about 8 months. I have yet to see an actual explanation for when and why they flower; I suspect it's related to how much light they're getting, in part, but the one I have in a big south window at home doesn't flower, while some sad little cuttings I took and stuck off to the side of a north window at home do. So there's got to be more to it than just light. You might try (if it's still in the original pot) moving it up to a larger pot and putting it outside, as soon as you're past your freeze date: more light and new soil might give it a boost. Even if you don't, though, your plant will probably get around to blooming eventually. Here's an article about the purple heart's pollution removing ability. I just inherited one of these plants from a neighbour. Now I know why! Your advice is invaluable. Now I know how to keep this beautiful plant looking pretty. Thank you! I have this planted in a pot with a beautiful light green cascading succulent (the name escapes me now), but yes, the garden center that sold it to me told me that it will flower in bright light and warm temperatures, so if you set it out over the summer you'll get flowers. I have a pretty brown thumb, but mine flowered well outside in zone 5 this summer, and is now greening up a bit inside preparing to overwinter. It may not require being outside; I have a hanging basket in the northwest corner of the plant room, getting direct sun only for a few hours in the afternoon (and some of that's blocked by a maple tree), and it's been flowering lately. Granted, even inside, it's still getting enough light to stay purple, so YMMV. I love this plant!! Its colors, green and purple, its cute 3 petaled light pink flowers with yellow/orange; I love the fact that it is very resilient. I found a fallen stem from a pot outside a business and brought it home. Rooted it in water and potted it late in October. In a couple of weeks, indoors, I was so pleased to see the flowers open in the morning (as early as 6 AM one day). I gave stems to friends and relatives for Christmas. A friend just told me how well his is doing, indoors, on a sunny spot by the window. Mine did so well during my 2 week trip. I found it so full and tall still flowering, only more green than purple. 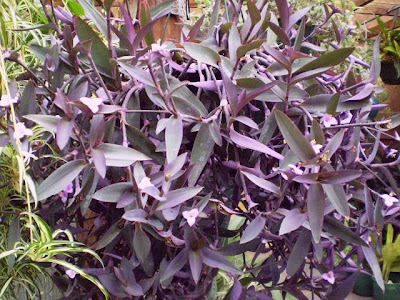 Look up Wandering Jew Pale Puma.. its super nice, I have one. Shorter stockier leaves..